Like the United States, Canada officially recognizes several Christian holidays, including Christmas, Good Friday, and Easter. Canada, however, gives its citizens a few more days off to celebrate. For instance, the Monday after Easter is an official holiday, as is Boxing Day (the Feast of St. Stephen) on the day after Christmas. Here's a look at some of the uniquely Canadian holidays celebrated across most of Canada. While Canadians celebrate Thanksgiving, the holiday arises from a different set of circumstances and falls on a different date than the same-named holiday in the United States. Americans mark the meeting of the Pilgrims and Native Americans for the harvest celebration in Plymouth on the third Thursday in November. Canadians, however, celebrate their Thanksgiving Day on the second Monday in October. It started as a civic holiday in April 1872, to celebrate the recovery of the Prince of Wales from a serious illness. Once celebrated at the same time as Armistice Day (known in Canada a Remembrance Day), Thanksgiving was made an official national holiday in 1879. Known in the U.S. as Veterans Day, the holiday formerly called Armistice Day marks the date and time when armies stopped fighting World War I. on November 11 at 11 a.m. in 1918 (the eleventh hour of the eleventh day of the eleventh month). Some 100,000 Canadian soldiers died in the First and Second World Wars. The official commemoration ceremony is held at the National War Memorial in Ottawa. In Canada, Remembrance Day is a federal statutory holiday observed in almost all its territories and provinces, with the exceptions of Nova Scotia, Manitoba, Ontario, and Quebec. In many other countries in the world, this day is observed on the national level. This celebration of Queen Victoria's birthday is marked with parades and fireworks across much of the country. It's been celebrated as an official holiday since 1845 and serves as the informal start of summer in Canada (much like Memorial Day does in the U.S.). July 1 is the date Canadians celebrate the ratification of the country's constitution in 1867. Much like the American Independence Day holiday on July 4, Canada day marks the date the British North America Act formally joined Canada, New Brunswick, and Nova Scotia into one country, a dominion of the British Empire. It's not quite Canada's "birthday" as it's sometimes called, but it's pretty close. 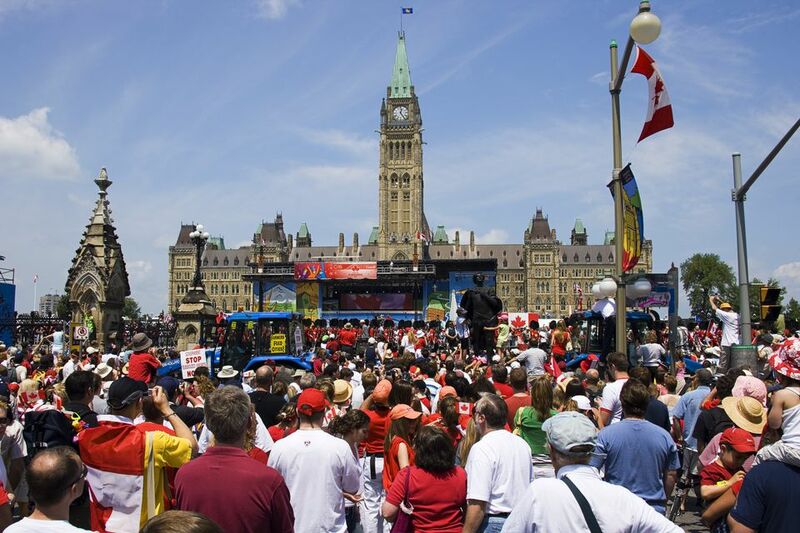 Canada Day is celebrated with parades, fireworks, concerts, and other events. A member of the British Royal Family usually participates in the festivities in Ottawa.